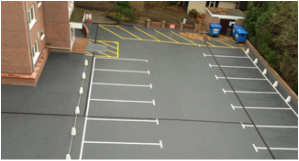 The car park asphalt surface was showing signs of (age related) wear, and the residents association had decided they would take up both asphalt and screed surfaces and replace like-for-like. 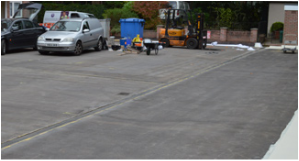 As a cost saving measure we recommended a Tremco Car Park Deck System which would provide a more economical and less disruptive alternative. This involved removing all existing coats by means of shoot blasting followed by a powerwash and hoover clean to the entire surface. We then applied a primer and membrane system followed by an anti-slip layer. This was then finished off by applying two coats of waterproof seal and wear coating. 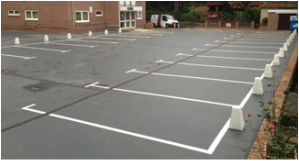 Line markings were then marked out and applied to the final surface. We undertook a survey to establish a number of defective areas of render caused by water to all four elevations of a building block within the Q A Hospital complex.